The Agilent N9310A is ideal for electronic manufacturing test for modern consumer products like cordless phones, digital radios, GPS modules, RFIDs and wireless LAN devices. 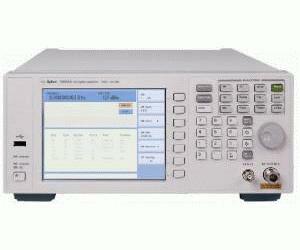 It is the first in this new entry-level of RF basic instruments. It comes with all the capability and reliability you need – at a price you always wanted. This new signal generator is very easy to operate. It generates common RF signals from 9 KHz up to 3 GHz. With its built-in analog modulation capabilities, it can generate modulated AM, FM, ØM and pulse signal easily. Adding optional analog IQ input capability; it can generate complex IQ modulated signals such as GSM, cdma and OFDM signals from custom IQ inputs.